Volunteers and Foster homes needed for small animals. Ferrets & Bunnies. Please go to volunteer page, download, fill in the volunteer form and foster form and then email them to us. We are a home-based rescue. We opened our doors in response to discovering that one of the local county pounds didn't accept ferrets. This was leaving owners that need to find a new home fast with few alternatives. Navarre Ferret Rescue focuses on helping those ferrets that find themselves in county shelters as well as offering a safe place to surrender a ferret to give it time to find a permanent home. We also work to promote proper husbandry of ferrets based on the latest research. 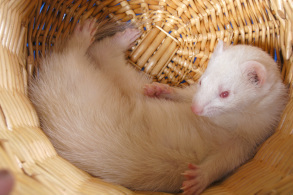 We also welcome emails for advice on how to deal with difficult behaviors so the owners can find a way to train the ferret and be able to keep him/her. 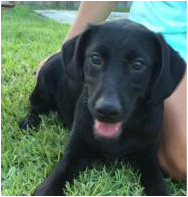 When fosters are available, we also rescue dogs, bunnies, and other small animals. Ongoing Donations: To donate cages, blankets, and other animal care type items, please contact us via the email contact at the bottom of the page to arrange a drop off time. Thank you for your support! Donation Jar Locations: Ace Hardware, Navarre, Fl. Three Dogs and a Chick, Ft. Walton Beach, Fl. PetSmart: PetSmart is a big supporter of NFR. We have some of our pets that are looking for homes housed there and often visit the Pace store for adoptions and to buy supplies. Gift cards to PetSmart will be a big help on our next trip. Purchase at the Pace store and ask management to hold it for Navarre Ferret Rescue or contact us for a mailing address. Amazon Wish List: We now have a wish list posted on Amazon that includes the foods that we are currently feeding and other supplies that we are in need of, such as carnivore care and probios for our cancer guys. If you prefer to send items directly, this is a great way to do so. Tractor Supply: As you can imagine, we clean a lot of litter boxes. Our main litter of choice is Pellet Horse Bedding. Shipping is very expensive, but gift cards are a great way to help us keep our little carpet sharks clean. Our goal is to have $200 worth of reoccuring monthly donations from sponsors. 100% of the donations will go to feed, vet, and provide a proper environment for the animals in our care. An auto-response will be sent. Please check your spam filter if you do not get it.